The guinea piggy Benito has been losing chunks of hair lately. He hasn't seen itchy or moody, so it wasn't a piggy emergency, but I did want to get him over to a piggy professional. Luckily, Dr. Marsh at the Animal Kingdom in Saline is amazing with the little fuzzies. I packed up Benito and his piggy friend Gruden von Squeakycheeks so Benito would have someone to chat with on the drive over. 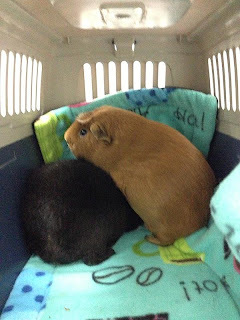 Edgeworth was in his own carrier - he was going to get his nails trimmed - and sat in the passenger's seat. He ate his parsley that I put in the carrier for him, and then stared at me the rest of the drive there. Bentio hides under Gruden von Squeakycheeks. Benito turned out to have a skin condition that isn't painful or itchy. He has lots of scurf, which looks looks like dandruff. There's no way to get rid of it other than giving him a bath every day. Benito doesn't really like baths, so we're going with the second option and giving him a good brushing every once in a while. Glad it's just something cosmetic and the little guy isn't comfortable in any way!